Here something tasty for the spaghetti lovers that is so healthy you'd want to make it for the entire family. Prepare spaghetti using your own recipe or store brought. 2/3 garlic cloves according to your taste, (I use 2). Wash and slice a small carton of cherry tomatoes and set aside, DO NOT saute these, (they will become mushy). In large skillet, over medium heat, saute garlic and onion in butter and oil about 2 minutes. Reduce heat, and layer zucchini and yellow squash slices on top of onion and garlic. Add salt, cover and steam 10 minutes, (for firmer vegetables do this for only 5 min) or until squash is tender. 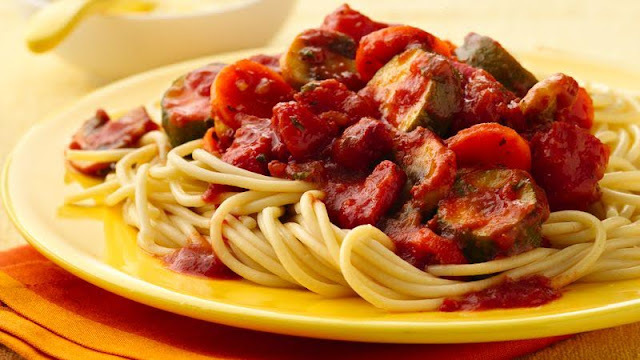 Once you have everything done put your pasta on a plate and cover it with the saute vegetables, than add your favorite spaghetti sauce and diced cherry tomatoes mix together and sprinkle some of your favorite vegan Parmesan cheese. This dish is light, airy, tasty, and above all it is healthy for you.